3528 LED Tape Lights vs 5050 LED Tape Lights? How many LED tape lights can be connected together? How to connect LED strip lights together? Determine where you want your LED strip lights for the best effect and ambiance. Measure the length of the areas where you want to install your LED tape lights. Cut the LED ribbon light shorter if needed. Note only cut the ribbon light on cutting mark manufacture suggests. Peel off the protective vinyl on the mounting side of the LED strip and place it on the place you plan. Plug power line interconnector to the LED driver. If there is no power line interconnector with tape light, simply attach the positive lead wire to the positive terminal on the driver, connect the negative lead wire to the negative side of the driver terminal. Plug inline driver to the outlet to light up the LED tape light. It depends on the size of your LED driver. The total wattage consumption of all connected led tape lights must be less than the LED driver. The LED strip lights have to be connected in parallel circuit. 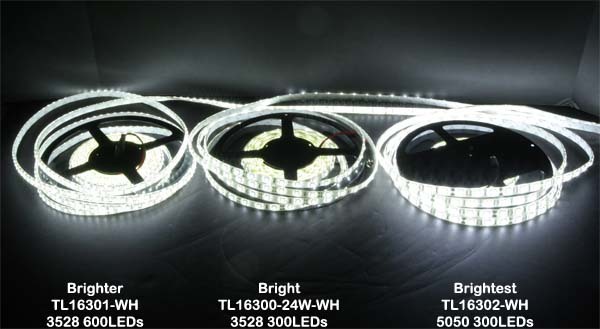 Although some might find LED tape lights also light up if it is connected in series circuit, but the LED tape light will get dimmer and dimmer toward the end.